Principal Greg Jones welcomes all guests and visitors. 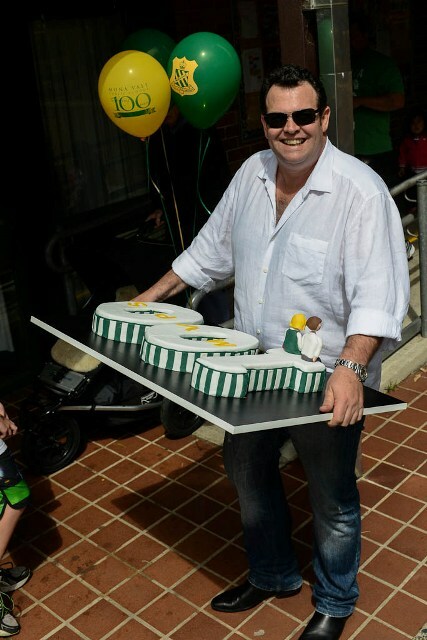 Gus Waldon taste tested this cake and recommended any who wanted a slice get in quick; too good to miss! Report by A J Guesdon. Pictures by Michael Mannington and A J Guesdon, 2012. 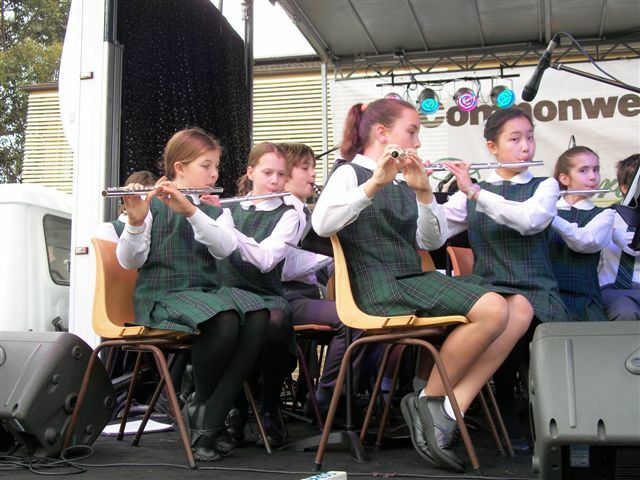 On Saturday, 15th September, 2012, Mona Vale Public School marked 100 years of classes at its Waratah Street site with a Festival Day. Current and former students and teachers, VIPs and the wider community were invited to mark the anniversary celebration, which included historical displays, entertainment, vintage motor show an official ceremony and cake cutting. 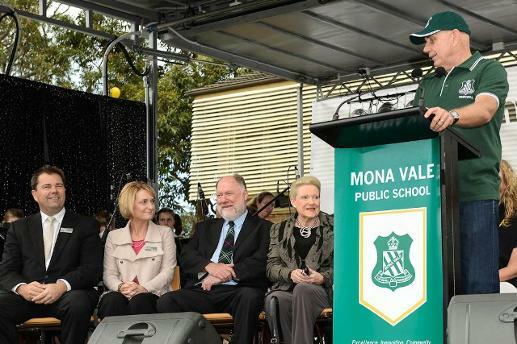 Principal Greg Jones rang the school bell 100 times to open the official ceremony, one peal for each year the Mona Vale Public School had taught generations of Pittwater children within its rooms. Principal Greg Jones related a little of the history of schools in Pittwater, in particular how Bayview Public school moved in the 1890’s to become Mona Vale Public school at Park street in 1906 and then to Waratah Street in 1912, opening with 87 students in two classrooms. Today this great local school has nearly 900 students and 70 teachers. Principal Jones welcomed special guests Hon. Bronwyn Bishop, Federal MP for Mackellar, Hon. Rob. Stokes, state MP for Pittwater, citing this gent as a strong supporter of public education at Mona Vale school, Cr. Harvey Rose, current Mayor of Pittwater with whom Principal Jones has a long history having been taught by Harvey at Narrabeen boys and whom he attributes his own enunciation to. Cr. Rose is known in our community for being a great orator and always finding the exact right words. 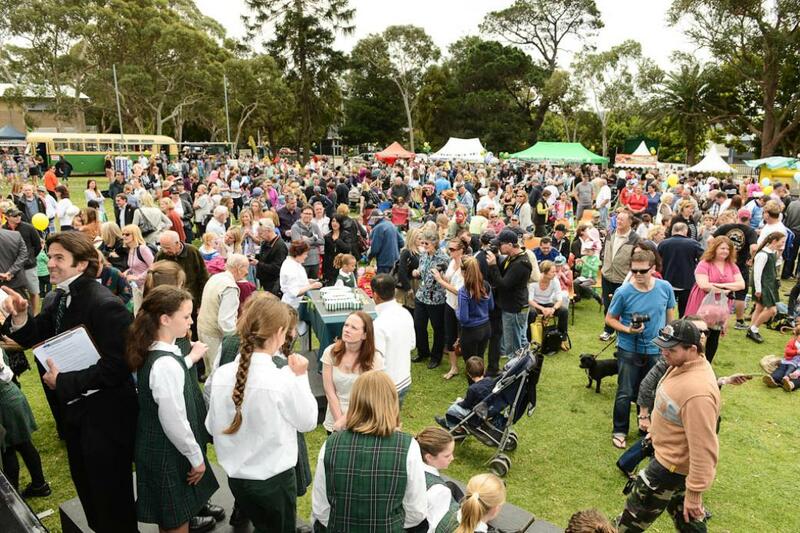 The three hundred volunteers who were everywhere throughout Mona Vale Public School’s grounds to assist all throughout the Festival Day, “a testament to the community’s engagement in this school”, were also warmly thanked by Greg Jones. Hon. Rob Stokes opened his address by acknowledging his fellow guests and in particular Cr. Harvey Rose who will soon finish his duties as Mayor of Pittwater. Mayor Rose was thanked for his huge contribution to the Pittwater community during his terms as Mayor and Rob’s address was interrupted by the applause his thanks brought. "This school has grown with our community, has rejoiced with our community, has suffered with our community, it has gone through everything with our community that our local families have gone through and has helped to build and forge this wonderful community in this wonderful part of NSW and Australia. If you go down to the cenotaph at Mona Vale Village Park, the names you see there, honoured for their sacrifice to our country, are the same names you see on the rolls of Mona Vale Public School. When you go into the local churches and look at the birth registry and marriage registry; the names you see there are the same names you see on the rolls of Mona Vale Public School. This school is Pittwater and Pittwater is this school. It’s that important to who we are and defining who we are as a community." 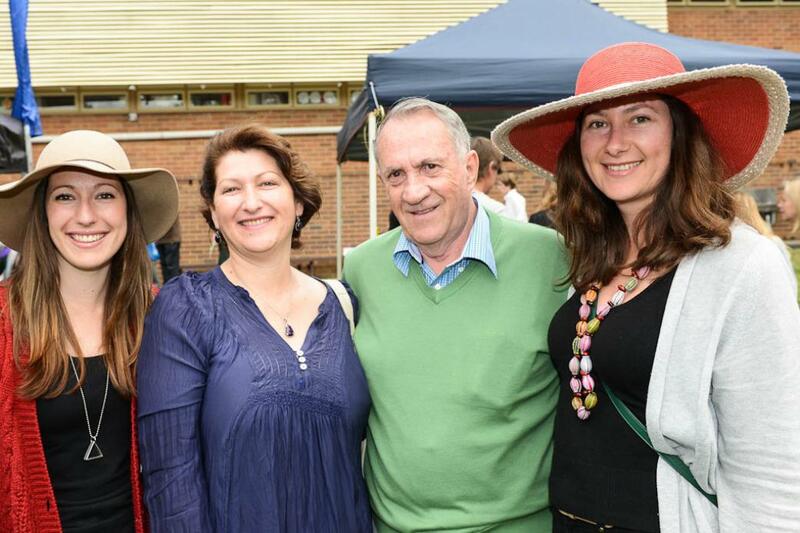 At least two thousand people, grandchildren, grandparents, parents, sometimes four generations of one family, visited Mona Vale Public School yesterday. In their ranks are Surf Club captains, nurses, local serving police, just about everything under the sun anyone can do. Even visitors who didn’t attend this school were welcomed like family and generously provided with small stories and insights that stretched as far back as they will, surely, move forward. The closing of the official ceremony nominated the students, the children of today and tomorrow, as the most important people on the grounds yesterday. This true note received the loudest cheer; family lives here, generations of people, whether well known or not, whether strangers or lifelong friends, who recognize something in each other’s eyes or something of each other’s face. Great schools are built by great people, by community. They are housed not just in structures but in our hearts, furnished with our clearest thoughts. Mona Vale Public School has furnished thousands with gifts beyond worth and in her hundredth year is determined to do it all again. A song best heard in her many children’s laughter. 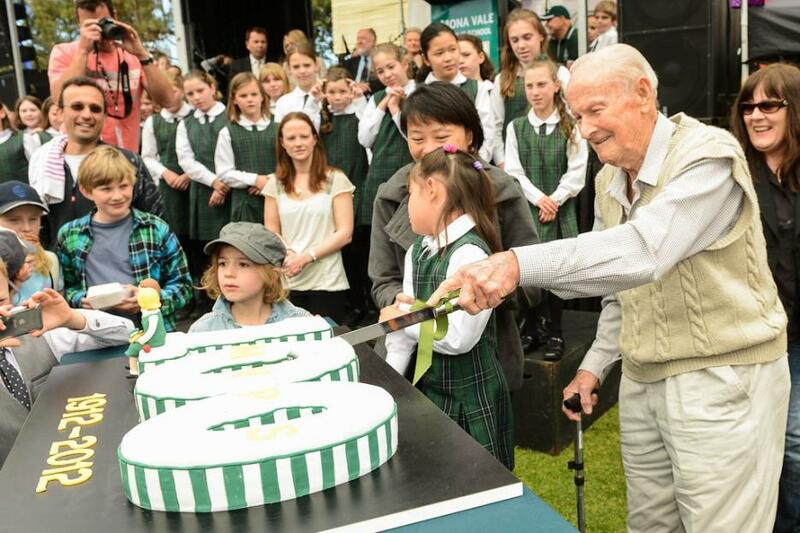 The oldest and youngest students cut the cake; Jim Dunn (91 years young) and Elissa Rich ( 5 years old). 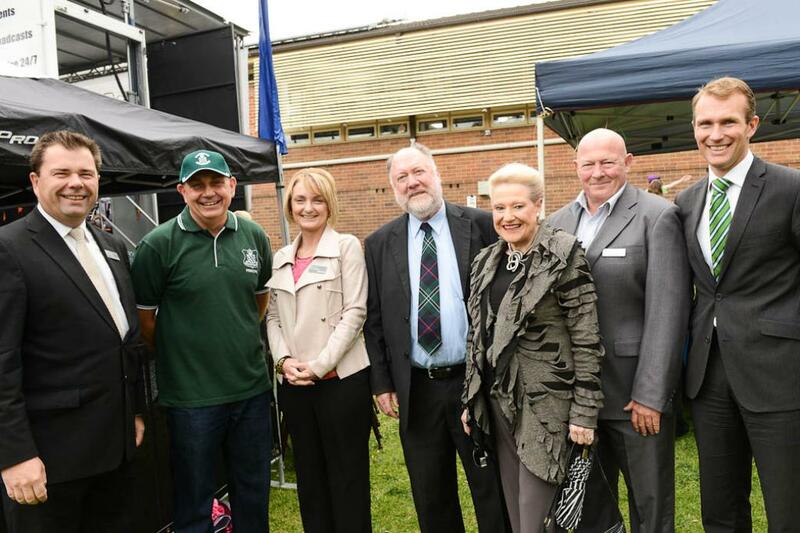 Left to right: Dean White, School Education Director Northern Sydney Region (NSW Education and Communities), Principal Greg Jones, Jane Simmons, Regional Director (NSW Education and Communities), Mayor Harvey Rose, Hon. Bronwyn Bishop, Cr. Ian White, Hon. Rob Stokes.